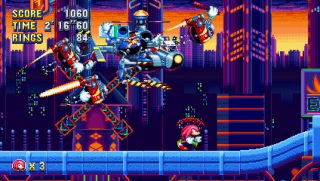 The Heavy Gunner is one of the Hard-Boiled Heavies and the third mini-boss encountered in Sonic Mania. The player confronts him at the end of Studiopolis Zone Act 1. The Heavy Gunner is an auto-scrolling boss - both the boss and the player move constantly to the right. The Heavy Gunner flies at the top of the screen in a helicopter, rocket launcher in hand, accompanied by three Eggrobos. He will fire waves of three rockets at the player, consisting of two red rockets and one blue rocket in a vertical line (the top rocket is the first to appear on screen). The player must avoid the red rockets and strike the blue ones, either by jumping or rolling into them. Upon hitting a blue rocket, the rocket will spin out of control and direct itself back toward the Heavy Gunner, at which point he will fly offscreen causing the rocket to hit one of the Eggrobos in his place. Successfully hitting four blue rockets will defeat the Heavy Gunner and his Eggrobo companions. Upon hitting the final rocket, the Heavy Gunner will evacuate his helicopter and fly offscreen just before the rocket destroys it, ending the fight. The player can then proceed to the signpost and finish the Act.